Wise words by Billy Shakespeare. As an actor, you got to give that man some props. And, that’s just what I’m doing in this year’s Hollywood Fringe Festival. I am starring in the US premiere of LOVE LABOURS WON, the critically acclaimed Shakespearean pastiche play. (If you don’t know what a pastiche is, that’s OK. Neither did I. Think: parody, but in a good way). 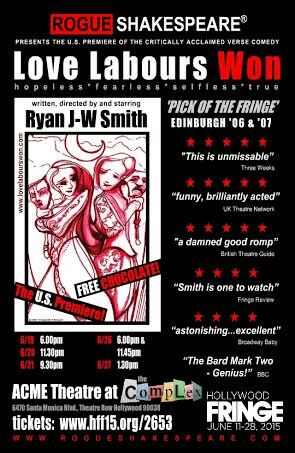 This play won Pick of the Fringe in Edinburgh 2 years running (that’s a BFD), and now we’re doing it here. Check out the website to read more of the effusive reviews and check out flier below for show times!